HURFOM: On June 21st 2018, the Mon State government declared that they had reversed their decision to dismiss Mi Than Htay, also known as Mi Jaloon Htaw, of Taranar village, Kyaikmayaw Township, who had been removed from her position as village administrator on April 26th 2018. According to a villager, local residents lack trust in the Mon State government’s decisions. “They decided to remove Mi Than Htay without any investigation on the ground. I think they’re corrupt [biased against her]. This [the Mon State government’s U-turn] happened only after I led about 1,500 villagers to sign a petition, and appealed the decision to the Union level,” said Nai Kyin, a Taranar resident. 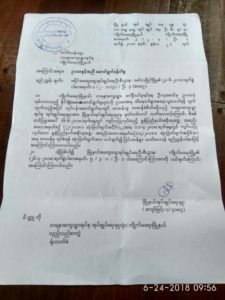 The villagers issued an appeal to the President’s Office, the Speaker of the Pyithu Hluttaw (House of Representatives), the Ministry of Home Affairs, the Anti-Corruption Commission, and the Mon State Complaint and Appeal Letter Review and Assessment Committee. Mi Than Htay was fired after U Hla Maung, a Taranar resident, reported her for not taking action against U Cho, a US citizen. U Cho was accused of destroying U Hla Maung’s fence. Mi Than Htay also failed to notice that U Cho, a foreigner, had stayed in the village for a long time without registering. U Hla Maung further claimed that Mi Than Htay did not take action against U Cho’s violent and drunken behavior. “The Mon State government’s letter reversing their decision reached my house on June 21st. I was travelling at the time, so I didn’t receive the letter until June 24th. I feel now that the truth has been uncovered. And I’m happy because, thanks to the efforts of the members of parliament and the villagers, I have regained my reputation,” said Mi Than Htay. She added that the letter did not fully satisfy her, as the Mon State government did not admit that their decision to remove her from her position had been wrong. Instead, the letter stated that the government had amended their decision, and reprimanded her for her lack of responsibility. Mi Than Htay said she has not decided yet whether to resume her position as village administrator, even though the Mon State government had made the decision on June 6th 2018 to cancel her dismissal. “I have to listen the voice of the people. I’m satisfied because I have regained my reputation, but I don’t want to resume my position. But the people [the villagers] have made a huge effort to help me resume my position. I will let people know that I would like to retire, and if they accept my decision, I will retire. If they want me to resume my position, I will continue my work for the next one and a half years,” continued Mi Than Htay. According to U Myint Than Win, the Chief Director of the Mon State government, more than a thousand villagers signed a petition appealing against Mi Than Htay’s dismissal. On June 6th 2018, at the 14th meeting of the Mon State government, the government decided to amend their previous decision, and to reprimand her for her behavior. “She wasn’t re-appointed. We just changed our decision. She has the right to compete in the next village administrator election in accordance with the third edition of the village administrator law. If she wins the election, she can be a villager administrator again,” said U Myint Than Win. Nai Kyin, Taranar resident, told us that Mi Than Htay would certainly win the village administrator election if an election is held. Mi Than Htay was the first female administrator in Mon State when she was elected in 2015.